Chickpea and white lupin roots are able to exude large amounts of carboxylates, but the resulting concentrations in the rhizosphere vary widely. We grew chickpea in pots in eleven different Western Australian soils, all with low phosphorus concentrations. While final plant mass varied more than two-fold and phosphorus content almost five-fold, there were only minor changes in root morphological traits that potentially enhance phosphorus uptake (e.g., the proportion of plant mass allocated to roots, or the length of roots per unit root mass). In contrast, the concentration of carboxylates (mainly malonate, citrate and malate, extracted using a 0.2 mM CaCl2 solution) varied ten-fold (averaging 2.3 μmol g−1 dry rhizosphere soil, approximately equivalent to a soil solution concentration of 23 mM). 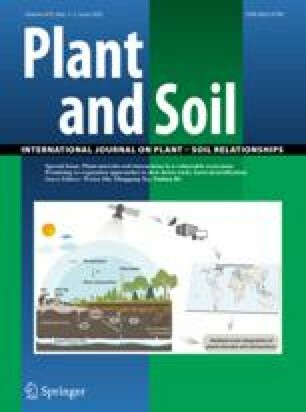 Plant phosphorus uptake was positively correlated with the concentration of carboxylates in the rhizosphere, and it was consistently higher in soils with a smaller capacity to sorb phosphorus. Phosphorus content was not correlated with bicarbonate-extractable phosphorus or any other single soil trait. These results suggest that exuded carboxylates increased the availability of phosphorus to the plant, however, the factors that affected root exudation rates are not known. When grown in the same six soils, three commonly used Western Australian chickpea cultivars had very similar rhizosphere carboxylate concentrations (extracted using a 0.2 mM CaCl2 solution), suggesting that there is little genetic variation for this trait in chickpea. Variation in the concentration of carboxylates in the rhizosphere of white lupin did not parallel that of chickpea across the six soils. However, in both species the proportion of citrate decreased and that of malate increased at lower soil pH. We conclude that patterns of variation in root exudates need to be understood to optimise the use of this trait in enhancing crop phosphorus uptake.